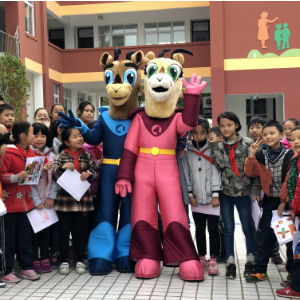 Qatar Airways China commemorated 15 years of operation in China by visiting the Qatar Airways Hope School in Guangyang, Sichuan, last month, with surprise appearances by the airline’s adorable and friendly mascots – Orry and Orah. The Qatar Airways China team, led by Vice President for Qatar Airways North Asia, Mr. Joshua Law, journeyed to Guangyuan City, Sichuan on 26 October to meet and engage with students, teachers and the entire school community at the Qatar Airways Hope School. Qatar Airways Hope School was a joint project with China Youth Development Foundation (CYDF), and was swiftly carried out in the weeks following the 8.0 magnitude earthquake which wiped out villages and towns throughout Sichuan province in 2008. The school officially opened in June 2010. In total, more than 7,000 school buildings were destroyed in the earthquake, and almost 5,000 lives were lost in Guangyuan alone during the 2008 Sichuan Earthquake. On the occasion of the airline’s 15th anniversary in China, the Qatar Airways team brought along Oryx Kids’ Club mascots, Orry and Orah, to lead the Hope School students in an energetic morning workout session, followed by a drawing session where the students were encouraged to put pen to paper and depict their best wishes for Qatar Airways. The pictures the students drew not only illustrated their congratulatory messages for the airline, but also showcased their own bright hopes and expectations for their future. In October 2018, Qatar Airways celebrated 15 years of service to and from China, with its first flight to China beginning in October 2003 to Shanghai. Qatar Airways currently operates 45 weekly flights to seven Greater China gateways: Shanghai, Beijing, Guangzhou, Hangzhou, Chongqing, Chengdu and Hong Kong. In May and September 2018 respectively, Qatar Airways’ award-winning Qsuite Business Class experience debuted on the Shanghai and Hong Kong route and will be welcoming Beijing-based passengers onboard from December 2018. Giving back to the community is at the core of Qatar Airways’ values, with education being a key focus. The airline is also a proud longstanding partner of Educate a Child, a global programme which helps provide quality primary school education to millions of out-of-school children globally. One of the world’s fastest-growing airlines, Qatar Airways operates a modern fleet of more than 200 aircraft flying to business and leisure destinations across six continents. The award-winning airline recently revealed a host of upcoming new global destinations, including Gothenburg, Sweden; Da Nang, Vietnam and Mombasa, Kenya.